MANILA, Philippines - The November 2017 Geologist board exam results which include the complete list of passers, top 10 (topnotchers), top performing schools and performance of schools are available on this page as announced by the Professional Regulation Commission (PRC) and the Board of Geology (expected) on Monday, November 20 or in two (2) working days after the exam. UPDATE: 183 out of 453 passed the exams. 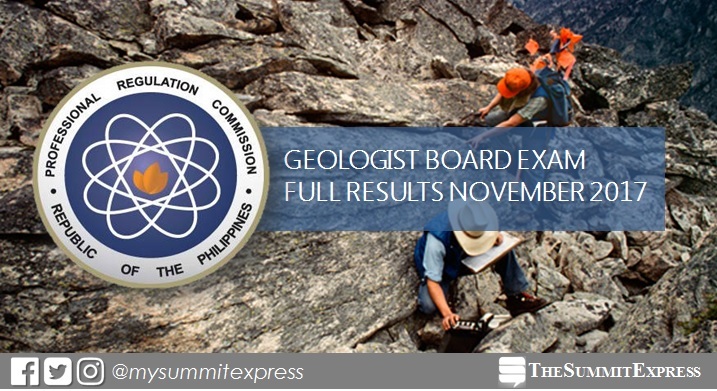 The Geologist board exam was administered in Manila and Davao on November 14, 15 and 16. The members of the Board of Geology who gave the licensure examination are Rolando E. Peña, Chairman; Elmer B. Billedo and Benjamin S. Austria, Members. From November 28 to 29, registration for the issuance of Professional Identification Card (ID) and Certificate of Registration will be done on-line. Please go to www.prc.gov.ph and follow instructions for initial registration. Successful examinees should personally register and sign in the Roster of Registered Professionals, PRC said. Geologist board exam's verification of ratings (passers, non-passers and removal) can be done online. Visit PRC's "Verification of Rating" service and enter the required information to verify your identity. Note that this will be available in few working days after the release of results. Geologist examination covered the folllowing subjects: general geology (Day 1), petrology and mineralogy (Day 2) and applied geology (Day 3). According to PRC Resolution No. 2016-1019, the target release of results of the recent BLEG is on Tuesday, November 21 ( 3 working days). In the November 2016 exams, results were released in three (3) working days. PRC named a total of 189 out of 395 who have passed the exams. University of the Philippines - Diliman (UPD) was hailed as the top performing school, 88.00% (66 out of 75). In the February 2016 examinations, results were announced online in just 2 working days. A total of 144 out of 267 passed the exam. UPD was the top performing school with 100% passing rate or 63 examinees passed the tests. Monitor this page for the real-time updates on Geologist board exam results. Check out also the official website of PRC for more information.